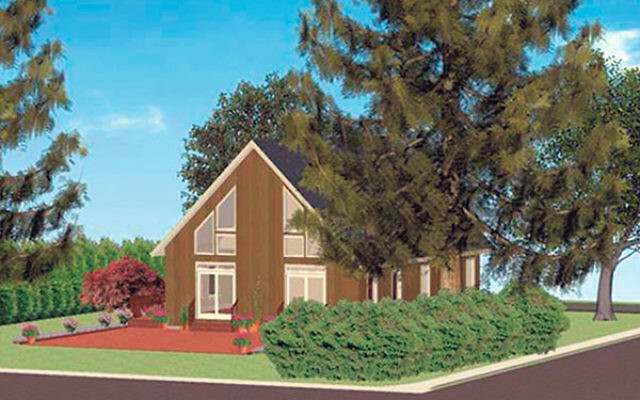 A rendering of the finished Shabbat House building. Within a few weeks, Rabbi Boruch and Devorah Klar will move out of their West Orange home — in a residential section where most of the town’s Shabbat-observant people live — and into Shabbat House, their newest venture. Shabbat House will offer opportunities for guests to enjoy Shabbat dinner or lunch and take part in a variety of pre- and post-Shabbat activities, from baking hallah to cooking the meals to participating in a Havdala service or motzei Shabbat gatherings. Located in what is arguably the Jewish commercial heart of Essex County, on Eagle Rock Avenue at the intersection of Pleasant Valley Way in West Orange, it is at the edge of an area zoned for residences, on what was an empty piece of land donated 18 years ago to Chabad of Essex County. The Klars are used to having a crowd for Shabbat; he is the Essex County Chabad director, and together they’ve often hosted as many as 70 people in their home for Friday evening or Saturday meals. “If we have 20 people, it’s like, why aren’t we having guests this weekend?” quipped Boruch, sitting in the unfinished kitchen of Shabbat House, a prefabricated structure installed over the last few months. As the clank and thwack of construction continued around him on a recent Wednesday afternoon, he and Devorah took obvious pleasure in each new milestone, from the arrival of the toilets and bathroom tiles to the installation of steps leading to the front door. Regardless of the multitudes they have reached at their Shabbat table over the decades, the Klars believe this traditional experience — which, when done well, provides spiritual and physical nourishment — has been too dependent on personal interaction with them or someone in their circle. “To come to my house, you need an invitation,” said Boruch. In a few weeks, as soon as they receive a Certificate of Occupancy from the town, Shabbat House will launch. Most of the activity will take place on the ground floor, a 1,300-square-foot area that includes a large dining room with high ceilings and plenty of natural light, a kitchen where meals will be prepared by members of the community, a sitting area off the dining room for lounging and chatting, and two bathrooms (one with a stall shower). Downstairs is an area designated for children’s programming; the Klars’ private apartment, just for them, will be upstairs, along with a guest room. An extra bathroom upstairs will be available to the guests. As happens with so many construction projects, this one has gone over budget. Leaving their home enabled the Klars to cover the estimated $330,000 cost of installing and preparing the prefabricated home — but they now expect to be running about $100,000 over the original estimate. As with the development of their other ventures — which over 40 years in the community have included the West Orange Jewish Renaissance Fair, which ran for more than 30 years; Café Devorah, which operated at Fairleigh Dickinson University in Madison; a Shabbat “resort” in Morristown; the Lubavitch Judaica store in West Orange; and the creation of a patented menora and associated business that brings in more than $1 million each year — they simply have faith it will all work out. The house is intended to be used for people to come to discreet programs, and not as a Shabbat “resort” or hotel. It is also not intended to be a synagogue or take the place of one. In fact, that has been a sticking point with the township, according to Klar, since the land is zoned residential. In a more basic way, as a Chabad rabbi, it is Klar’s philosophy that it is advantageous for him to meet people where they are — and that, he said, is decisively not in synagogue. According to a 2013 Pew Research Center study, fewer than one third of American Jews belong to a synagogue, fewer than 23 percent attend synagogue once or twice a month, and one in five describe themselves as having no religion. And he prefers a table that is nearly in the center of town, more visible and accessible, to spark interest, to one in a residential enclave. Rabbi Klar has an easy manner and is quick with a smile, a story, or a joke. Devorah becomes animated as she describes her vision of facilitating people cooking in the kitchen for Shabbat and any number of ideas she has to enhance the experience. “It will be Shabbat all week long,” she said. They know there will be challenges, among them people who may abuse the no-fee rule and security issues. But they are confident that most people will not take advantage and remain committed to removing any obstacles, comparing the endeavor to Birthright Israel, the free trips to Israel for young people. Rabbi Klar said he hopes people will appreciate the Shabbat House experience. “No fee doesn’t mean people can’t donate after Shabbat,” he said. As for security, the Klars plan to require that all guests supply references, and they will have a security guard on duty. The Klars have hopes that Shabbat House will reach across the denominations, from unaffiliated to Orthodox. In fact, the concept of Shabbat House solidified for the couple after they participated in the Shabbat Project, an attempt to have Jews across the world and the denominational spectrum observe Shabbat together on one particular day each year. West Orange Orthodox and liberal congregations have collaborated in participating in the project over the last two years. “I saw what happened at the Shabbat Project, and I could not believe how much it pulled the community together,” said Rabbi Klar. They learned through that project that many of the Orthodox families in town were not having guests over for Shabbat and realized that through Shabbat House, the entire Shabbat guest experience would expand. “Shabbat House is open to anyone across the spectrum of Judaism, whether you have Shabbat every week but are just too tired to cook for guests, or you’ve never been to a Shabbat dinner and want to try one,” said Devorah.